Estimating Materials can often be a difficult task even for experienced landscapers, so as a homeowner we know exactly where you are. 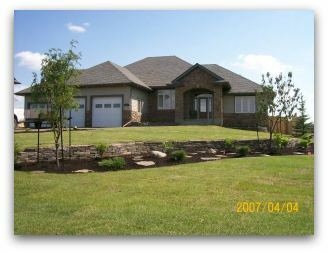 At Dream-yard, we continually strive to educate homeowners like you, to better understand the landscaping process. To do this, we will be showing you what happens at a landscape supply yard, a sod farm, a nursery, and a soil supplier. This will help you to understand where the products come from, how they are bought, shipped, grown, cared for and eventually delivered or sold to you. Whether you are landscaping with boulders, patio stones, or other landscaping materials, this series of articles will be a great help. It will show you many of the products, and how to estimate your needs. This information will also benefit you by allowing you to approach all your suppliers as a more educated consumer. 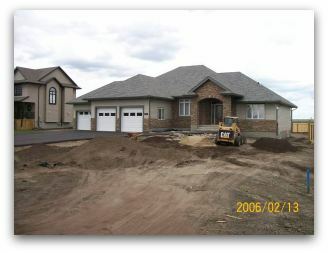 Before shot of front yard landscaping to include natural stonewalls, garden beds, irrigation and sodding. We are going to visit these suppliers and ask what they appreciate most from their customers. This includes what makes things easier for them at the yard, and also for their delivery drivers when they arrive at your project site. We also cover safety in and around their yards for you, and your children. Growing up in Canada in the 1970's, I was pretty fortunate to have learned both standard and metric systems. We are on the metric system, but because of our proximity to the US we still can use (feet, inches, yards, etc...), and from time to time you may find both used on this site. If you are having trouble with any measurement that we talk about, please feel free to use one of our conversion calculators, they look like this and are throughout the article on pages where we are discussing conversions. There are different things you should be aware of that can affect your landscaping material estimates. We are going to touch on each one of these in our articles. Pallets in landscaping yard. Photo compliments of Ornamental Stone. The geology of each region often determines what materials may be available at your local landscape supply yards or garden centers. Unique and non-native products may be trucked in from quite far away and the added shipping costs will be reflected in the price. This will make them more expensive than locally quarried materials. The geological composition of each rock is different, and that means they can have different densities. This can affect your estimates when dealing with natural products that are sold by weight. This, along with variations in shapes and sizes are the things that make it just that, an estimate. Excavating for a stone wall base. 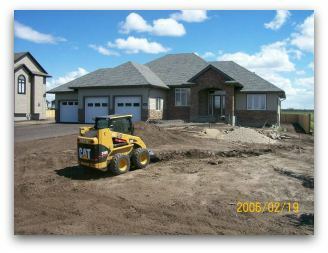 At the installation stage, compaction of soil, sand, and landscaping gravel will affect your estimates. You will need to compensate for compaction when ordering these products. Wastage, breakage, splitting and trimming can also change your estimates when dealing with flagstone or other natural rocks. When ordering sod, you will have to account for wastage from cutting. The more experienced you are, the less waste you will have. We will deal with these issues in each section, but 5% to 10% is considered normal. 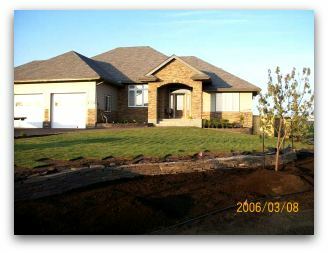 Laying sod in front yard after stone wall is completed. This is what landscapers are dealing with on a daily basis. If you don't account for all these things as a do-it-yourselfer, you can find yourself substantially short on materials. This may cost you time and money by having to order more loads, or return to the yard to pick up more materials yourself. Dealing with different unit measurements and selling methods. 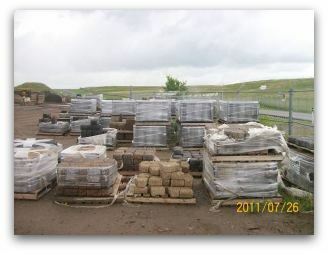 Stone and landscape supply yards can also sell and ship materials in different ways. Make sure you always bring them accurate measurements of your project, so they can work together with you on your order. One yard may sell flagstone by the square foot facing, while another may sell by the weight. Along with showing you what happens and what may be available at the suppliers, we will also be going over estimating more thoroughly in each section. Using the industry formulas and taking into consideration all the above variations, will give you more accurate estimates for your projects. At dream-yard, we love to hear from you. If you have specific issues with your project that may help others save time and money, please feel free to contact us. We hope you find this information helpful in building your very own dream yard. So let's get started with a visit to a landscaping yard.